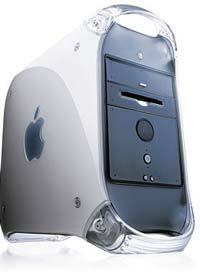 The PowerMac G4 (PCI Graphics) was announced in September 1999, along with the PowerMac G4 (AGP Graphics). Based on the same motherboard as the "Blue and White" G3, the G4 PCI added a Motorola MPC 7400 processor to an already succesful machine. Apple billed the 7400 as a "Super Computer on a chip", due to the fact that it was capable of excecuting more than a billion instructions per second (a gigaflop). Much of the 7400's speed increase was due to a new set of instructions, which were executed by a new unit on the chip. Motorola refers to this new unit as the "AltiVec" unit, while Apple publicly refers to it as the "Velocity Engine." The Velocity Engine vastly increased the speed of many common processor-intensive tasks. Originally, the MPC 7400 chip had been planned to debut in the G4 AGP model, but Apple was not able to get the new machine ready in time. The G4 PCI had been in the works in case of such an event, and allowed Apple to ship 7400-equipt machines while they worked out the final bugs of the G4 AGP. The G4 PCI introduced the new case design, similar to that of the B&W G3, but tinted in the new professional color, "graphite." The G4 PCI was priced at a modest $1599, and shipped standard with 64 MB of RAM, a 10 GB hard drive, a 32x CD-ROM, 56 kbps modem. Zip and DVD-ROM/RAM drives were available as BTO options. There were extreme supply issues with the G4 initially, due largely to Motorola's inability to deliver the 7400 chips in adequate supply. This was further compounded by an "errata" in the initial revision of the 7400 that effectively lowered the ceiling of the chip to 450 MHz. As a result, all models of the G4 were "speed dumped" in October. 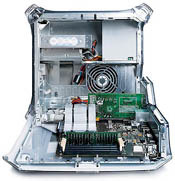 The PowerMac G4 PCI was decreased in speed to 350 MHz, for the same $1599 price tag. Existing orders for the G4 PCI/400 were largely honored. The G4 (PCI Graphics) was terminated at the end of 1999 in favour of a similar configuration based on the G4 (AGP) motherboard.